Potluck has been serving a free hot meal to anyone in need since 1991. Rain or shine, 52 weeks a year, we provide a hot meal, every Sunday, now at 8th Ave and Park Ave on NW Glisan. 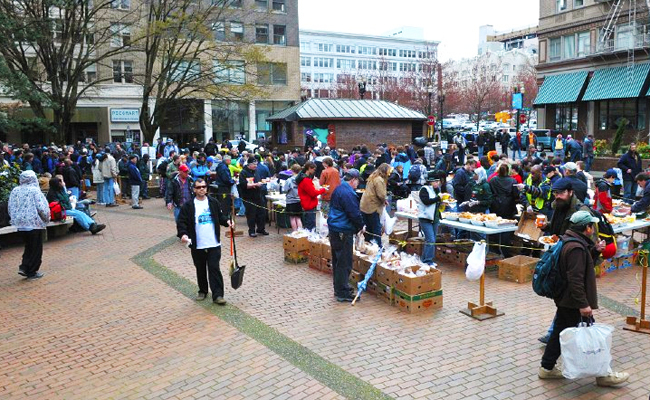 Four hundred to six hundred Portlanders do not go hungry on Sunday because of Potluck in the Park. It is only because of the generosity of volunteers and donations from people like you that our Potluck community continues to provide a meal to those in need.